For the fourth week in a row, Maimi’s bicycle trip to Shizuoka’s Kunouzan Toshogu shrine to pray for the success of ℃-ute’s recently released single, “Kimi wa Jitensha Watashi wa Densha de Kitaku” (You Ride Your Bicycle While I Catch the Train Home), was aired on “HaroPuro! TIME” (4/12). Maimi’s trip was the main focus of this episode, and it started off with Maimi getting sidelined when the chain slipped off her bike while she tried shifting gears. After a short while, Maimi managed to fix the chain herself, and asked everyone to remember that she’s a girl who can do anything if she tries. In high spirits because of her accomplishment, Maimi sang “Kimi wa Jitensha” to herself as she resumed her trip. Further ahead, Maimi came across a road she wasn’t able to cross on her bike, so she had to pick it up and carry it up some steps and across a bridge. Upon reaching the other side and getting back on her bike, Maimi once again sung “Kimi wa Jitensha” as she rode alongside a train. Now biking at night, Maimi said that it made her uneasy before breaking into a solo rendition of ℃-ute’s song “Midnight Temptation”. As she was stopped and waiting for the light, Maimi realized that the ocean was in front of her, though she couldn’t see it because it was pitch black. Though she was unable to see it, she said that it still made her excited. Tweleve hours after starting her trip, Maimi stopped at a convenience store to ask for directions to an inn. She arrived just in time to get a room, and after getting ready for bed, Maimi said she was surprised at herself for travelling over 80km in one day. Maimi then ended the first day of her trip by bidding good night to everyone watching. With the first day in the books, the announcer recapped the trip so far. In the first day Maimi travelled for about 12 hours and logged around 80km. 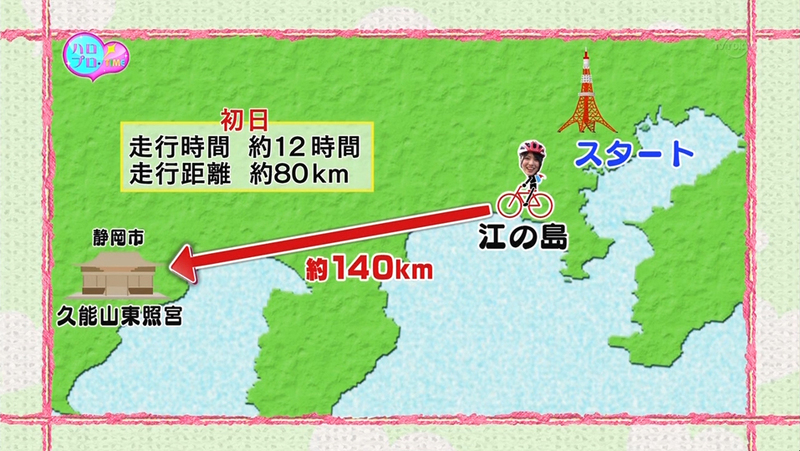 From Enoshima, around 140km remained between Maimi and her ultimate goal of Shizuoka. Maimi was rejoined on the morning of day two as she sat down for breakfast at the inn. After finishing and showing off her completely empty plates for everyone, Maimi set Atami (around 60km from Enoshima) as her goal for the day. Before heading out, Maimi gave the innkeeper a signed copy of ℃-ute’s album “Utsukushikutte Gomen Ne”. As Maimi set off for Atami, she saw the Enoshima Sea Candle lighthouse and remembered the time she went there with Nakajima Saki and Okai Chisato for a previous episode of “HaroPuro! TIME” (which aired 11/24/2011). Further along, Maimi’s saw the number 134 line, and started singing her duet with Suzuki Airi, “Image Color”, to herself. After around 2 hours and 30 minutes, Maimi arrived in Odawara and stopped to eat before heading off to a bicycle racing track. She asked if she could try running up the steep side of the track, and was given the go-ahead. Maimi then rode a few laps around the bottom of track while expressing her amazement at how fast the cyclists at the top of the track were going. Forging ahead up some hills, Maimi arrived at her destination of Atami and the segment ended with Maimi spotting some mysterious steam rising in the distance. This episode of “HaroPuro! TIME” also featured a second “Yajima TIME” segment, which briefly showed the filming of the “Yajima Maimi Short Movie “Totsuzen” Dance Ver.” variation of the “Kimi wa Jitensha” music video, which can now be seen on YouTube here. 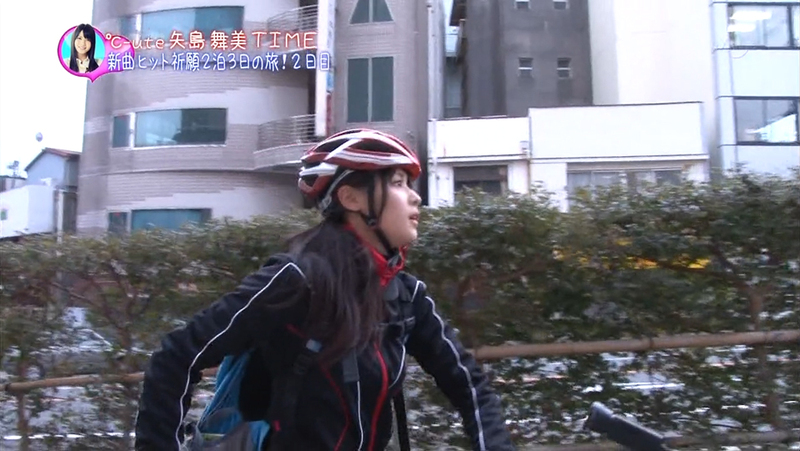 The episode ended with another preview of the following week’s bicycle trip segment, which showed a seemingly defeated Maimi stopped at the side of the road. Posted on April 22, 2012, in Recaps and tagged Yajima Maimi. Bookmark the permalink. 1 Comment.